NOTE !!! — RESCHEDULED TO APRIL 15-30, 2020 —NOTE!!! This workshop is rescheduled for April 2020. We will reverse the order of what is printed below and I’ll update it to the correct itinerary. That is, first, we’ll visit Region 11 (Marble Caves, Furioso Forest, Jet Boat, etc) first and Region 12, Torres del Paine National Park & surroundings second. 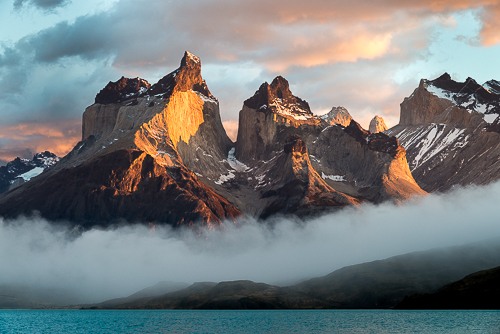 Patagonia in autumn is a landscape and wildlife photgrapher's dream come true. This trip includes the very best of two regions (states) of Chilean Patagonia: the world famous, high drama Torres masif of region XII to the sublime lake district of Region XI with stunning native beech forests in reds and yellows, and rivers so blue you stare in disbelief. Delicate guanacos are ubiquitous, majestic condors, the largest flying birds on, er, above Earth and myriad other raptors and more diminutive birds are plentiful. Our trips are always expertly outfitted and guided by Salvaje Corizon, the Patagonia Guide Service. We explore the most varied locations in Chilean Patagonia at the most exciting time of the year. This is a two-region workshop or, as we like to call it, a Photo Safari. We first gather in Punta Arenas on the Straits of Magellan and drive to Torres del Paine National Park, a world famous collection of rugged spires, glaciers and lakes. In part two we fly to the central Patagonian region 11, Aysen, a zone of turquoise lakes and rivers, native beech forest, dramatic glaciated peaks and magnificent marble caves—Unknown (and mostly unphotographed) Patagonia. This is the travel day from your origin to Santiago to Punta Arenas, the Capital of Chile's 12th region, right next to the Straits of Magellan and Tierra del Fuego. You'll be picked up at the airport and driven to Hotel Cabo de Hornos for Pisco Sours and a Chilean welcome dinner. Our day begins with a dawn shoot of the Cuernos del Paine, directly across the lake from our hotel. After breakfast, we head off by van to explore the center of the national park. We will spend a second night at the Hosteria Pehoe. Another day devoted to the spectacular peaks and lakes near Lago Pehoe. In the evening we drive to a new inn, the Hosteria Grey on the shores of Lago Grey. A boat excursion on Lago Grey takes us to the face of the giant glacier feeding this lake. It takes us right beneath the blue cliffs of thousand-year-old ice. We spend a second night at the Hosteria Grey. Today, we once more change our base of operations, moving to the other side of the park, an area well known for its wildlife, especially guanacos and foxes that often seem to want to pose just beneath the most dramatic peaks. We spend the night at the Hosteria Los Torres. After a final dawn shoot, we pack up and head for Punta Arenas. An all-day trip to be sure, with more opportunities to photograph on the shores of Bitter Lake (Lago Amargo) as well as abundant wildlife, birds and dramatic beech forests en route to Punta Arenas. Hotel Cabo de Hornos. Today is a travel day. We depart after breakfast from Punta Arenas to Balmaceda, the airport that services Coyhaique (Co-yi-kay), the capital city of Region XI, Aysen. Some photography stops are possible from the airport to Coyhaique where we check in to our rooms. Early morning departure for Cerro Castillo and Rio Tranquilo. Cerro Castillo (or Castle Mountain) is one of the most photogenic and spectacular peaks in all of Patagonia. We continue along an impressive river valley, past reminders of a volcanic eruption, and over a mountain pass surrounded by glacier-clad peaks. In the afternoon we drive along the western shore of Lago General Carrera, the second largest lake in South America, to the little village of Puerto Tanquilo. From our lodge in Puerto Tranquilo, we visit the Cavernas de Mármol (or Marble Caves) one of the most spectacular and surreal landscapes in all South America. Then we continue around Lago Carrera, photographing the glaciers above the delta of the Rio Leones beneath Patagoina's highest summit, Cerro San Valentin. After a full day we arrive at the Green Baker Lodge on the banks of the Rio Baker. Today we photograph along the Rio Baker. The Baker river is known to anglers for its world-class trout fishing, but is irresistible to photographers for its otherworldly blue color. En route to the Chacabuco Valley, site of the future, Patagonia National Park, we visit the spectacular confluence (waterfall and rapids) of the Baker and Nef rivers. Valle Chacabuco is such a rich environment that this day we only begin our photographic exploration of it, returning in the late afternoon to the Green Baker Lodge. This morning we returm to the Chacabuco valley. This valley, part of the last great private ranch or estancia in Patagonia, has recently been purchased by the Patagonia Land Trust and is the core area of a large conservation/park project. The landscape changes dramatically into a series of pampas, grasslands and wetland ponds or mallines. Here we always encounter herds of wild guanaco. In the evening we return to Lago General Carrera, and check into Terra Luna, a lovely lakeside lodge near the little town of Puerto Guadal. After pre-dawn and dawn photography of the high icefield peaks across the lake, we head off to explore the southern shoreline of Lago Carrera: plunging cliffs, transparent turquoise water, enchanting fundos (farms) tributary rivers and deep red autumn trees provide constantly varying photographic stimulation. We spend a second night at Terra Luna. Return by road to Coyhaique, photographing the Rio Murta valley, the beautiful Rio Cajon or Box River, a valley of dead trees smothered by ash and lava from Volcán Hudson, and final evening photo opportunities around Cerro Castillo before reaching Coyhaique for a gala farewell dinner. Transfer to Balmaceda, airport for return flight to Santiago and home.